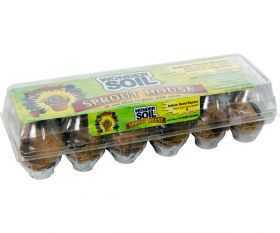 A patented reusable seed starter in an egg carton design. The Sprout House transforms into 12 little hot houses and includes 12 refills. It includes coir cups and compressed seed starting wafers made with coir, worm castings, mycorrhizae, and water saving polymers that expand with water to fill the cups. Roots grow through the porous coir cups for easy transplanting into pots or the ground.